THE first round of the Senior Cup dominated the AFA fixture programme over the weekend, with a number of local sides involved. Yardley Ex Services continued their unbeaten start to the season with a 1-0 victory over in form Elmdon Heath, with the only goal of the game coming from Adam Whitehouse. Elsewhere Acocks Green lost at home to AFC Somers 3-1, while JE Yardley had a good home victory over Pathfinder 2-0. The most entertaining game of the day though saw current Premier Division champions Shirley Athletic just edge past a youthful St Pauls side in a seven goal thriller. Shirley made a quick start and on ten minutes Mike Mountford found himself with time, wide right, and his pin-point delivery was met by the head of Simon Jamieson. But within just three minutes, St.Paul’s got themselves level. St Pauls were causing Shirley problems on the break and took the lead after a goal kick was not dealt with by the Shirley defenders at the back. In the second half, a Paddy Fanning cross was met by the towering head of James Cartland, to bring Shirley back on level terms. Five minutes later though, St Pauls took the lead again. With time running out, it was St Paul’s who were looking the more likely to see out the game, as Shirley kept giving the ball away. But with another free kick, Mountford found the top right hand corner to bring the scores level with only four minutes remaining. With seconds to go St Pauls were awarded a penalty, only for it to hit the post. 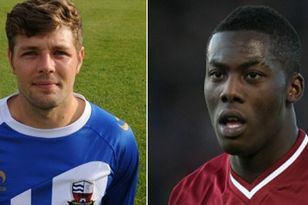 Then in injury time Mountford received the ball on the right, and played through Anthony Johnson - the linesman flagged for offside, but Johnson continued and bagged Shirley’s fourth in the 93rd minute, as the referee over-ruled the linesman. GSD were the big winners of the day in the Solihull Fox Hollies Sunday 6-a-side Leisure Leagues Premier Division after a 6-2 demolition of FCUK. The Legends cruised through to a crushing 5-1 victory over Opportunity Knockers, and Monskpath Masif claimed a 2-0 win against struggling Sunday Afternoon Delight. Ballbags got off the mark for the new Knowle Monday campaign with a 6-2 drubbing of KD Dynamos. Hall Green Harriers also picked up their first points with a 5-2 victory over Bought and Paid For, so too Billy More Mates who were 4-2 winners against Panic At The Astro. Desperados are the only side to have won all three of their games so far following a comfortable 3-1 win against Spartak Geesch. Joe Cole showed form more reminiscent of his England namesake in Fox Hollies Monday this week, leading Spartans to a 4-0 win over Lob FC, whilst Liverpudlians saw off Reluctant Allstars by the same scoreline, thanks to the form of David Thorne. There were 2-0 wins for both Wicks United and Mix-Ups over Aston Vanilla and Mill Lane United respectively, whilst The Gitites protected their 100% record with a Ben Greenaway-inspired 3-2 victory over FC Ajax. Knowle Girls kept up their recent winning ways with a fine 8-1 win against Marston Green at Hampton Road on Saturday. Four Goals from Shona Baldwin, two from Zoe Tinkler and one each from Millie Armstrong and Emily Priestley secured their second win this season. Kings Heath opened the scoring after ten minutes and it was only some magnificent goal keeping by Callaghan McLaughlin that managed to keep the score down. The game turned with a fantastic goal from Stefan Mason. He hit a powerful shot from 20 yards out that left the Kings Heath keeper clawing at thin air. With two minutes to go, an almighty scramble in the Kings Heath goal mouth resulted in Greg Janes almost breaking the net to win the game for the young Robins. ALTON Douglas will once again be taking readers back to the 1950s.